Would you like to find out more about our teas: gunpowder green tea, white tea or fruit tea, their origins, history and effect? Would you like to hear some anecdotes about clever emperors, trained monkeys and British tea culture? Or would you like some tips on preparing tea? Of course, you will also find a delicious tea recipe and the word "tea" in 44 different languages. Just click on what interests you and enjoy your read! Black tea, green tea or white tea: what's the difference? Why is there a tea called "gunpowder"? 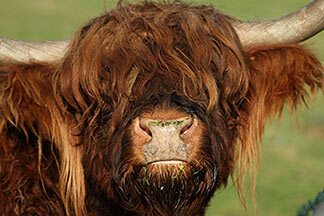 Tea – with milk, lemon, honey, cream, salt, yak butter or jam? 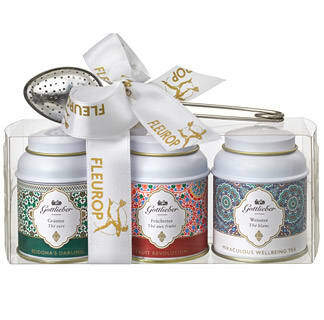 This gift set from Gottlieber will delight tea lovers everywhere. It includes green tea, white tea and fruit tea. 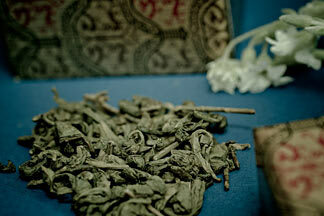 The gunpowder green tea "Buddha's Darling" comes from the Chinese province of Zheijang. 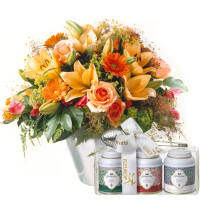 It comes in the shape of rolled leaves that develop a powerful aroma with a vibrant character in the cup. White tea is one of the most expensive tea varieties in the world. 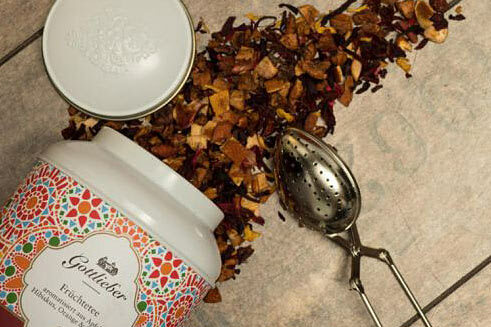 Gottlieber's "Miraculous Wellbeing Tea" is flavoured with red peppercorns and therefore has a slightly piquant flavour. In contrast, the "Fruit Revolution" tea mix (apple slices, hibiscus, orange peel, rose hips, sunflower blossom, peach and vanilla) is more aromatic and offers a unique taste sensation. 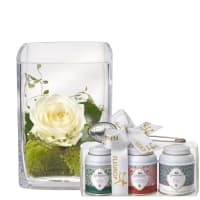 The three tea caddies have an oriental twist and come with a practical tea infuser, which means that the blends can be easily brewed and enjoyed. 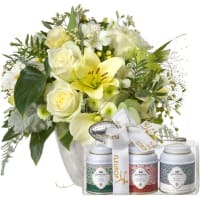 Flowers & tea gift set: visit the shop HERE. Whether you choose black tea, green tea or white tea: you will find the differences between them lie mostly in the way they are prepared. 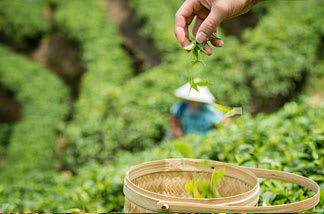 The freshly picked tea leaves undergo different preparation methods depending on the type of tea. 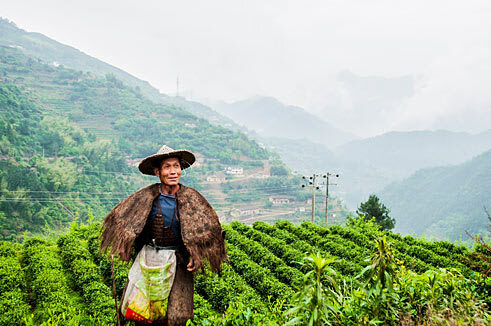 In the case of black tea, the tea leaves, which are picked by hand, are left to wilt and are then rolled, fermented and dried. In comparison with the other tea types, black tea has the highest caffeine content. 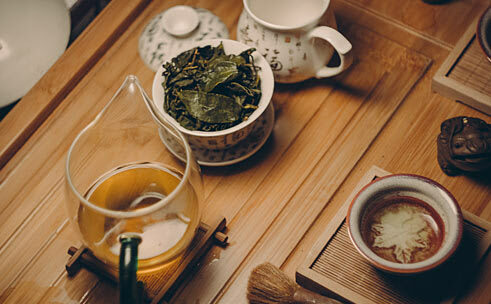 In the case of green tea, the tea leaves, which are picked by hand, are left to wilt and are then heated (roasted or steamed) rolled and dried. Green tea contains caffeine. However, this can vary enormously depending on the variety. 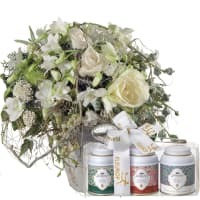 In the case of white tea, the unopened buds, which are picked by hand, as well as the two finest tea leaves are gently wilted in the sunshine and then dried. White tea does contain caffeine, but considerably less than the other tea varieties. Regarding the plants: these teas are all made from the camellia tea plant. 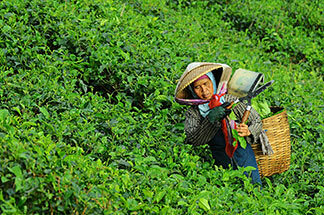 Both of the original tea plants come from the thea sinensis and the thea assamica. The latter produces strong dark tea, which is why its leaves are used primarily for black tea. In contrast, the leaves of the thea sinensis plant produce a light, bright tea with a strong aroma. 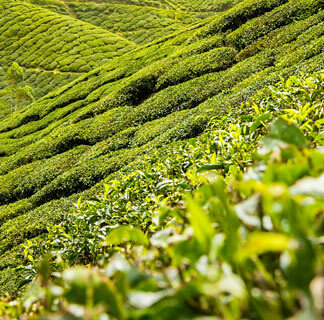 That is why this tea bush is ideal for making green tea and white tea. 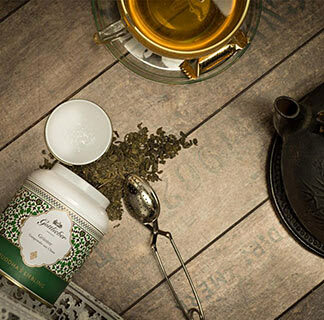 The history of green tea began many thousands of years ago when people first noticed that this tea was invigorating. This fact alone goes to show that one of its most vital ingredients is caffeine. Most of the health-giving properties of green tea are, however, ascribed to the so-called catechins. These are plant substances that help our bodies as radical catchers and are therefore good for us. They protect our cells from harmful UV light, for example. 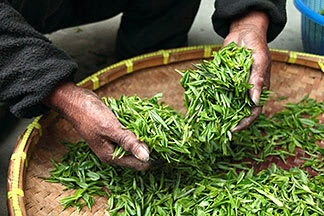 The amino acids in the tea leaves provide the flavour, theanine being the most important. This works directly on the central nervous system and reduces the classic symptoms of stress without making you tired. . Moreover, green tea contains an absolute cocktail of beneficial vitamins and minerals. This means that our teeth benefit from fluoride, our muscles from magnesium, our eyes from carotene and our muscles from a number of B vitamins. 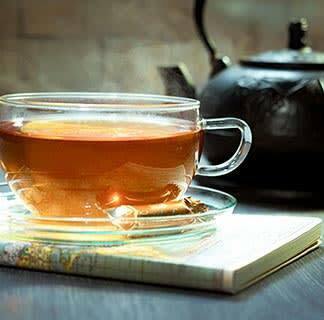 It is hardly surprising that green tea is considered to be a special weapon in the armoury of health. Just like black or green tea, white tea contains caffeine. However, the concentration of caffeine is low. This is why white tea has a stimulating effect but in a pleasantly gentle manner. It also contains protective polyphenols, which are secondary metabolites of plants. As radical catchers, they protect the cells of our bodies and our immune systems against the harmful effects of UV radiation and pathogens, and they also encourage our metabolisms. Moreover, the Chinese believe that white tea lowers blood pressure. White tea is believed to be the noblest tea in the world. Only the unopened buds, encased in a fine, silvery bloom, and sometimes the first two leaves are picked in spring to make this tea. 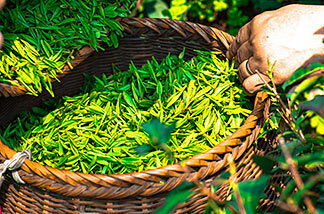 Since the leaves have not yet made any chlorophyll, white tea is deemed to be one of the mildest tea blends. The buds and leaves are processed in a particularly delicate manner. Once they have been picked, they are first wilted in the morning sunshine and then later in the shade. You feel so wonderful after a cup of fruit tea! This isn't just because of the delightful aroma and flavour, but is also due to the ingredients. Fruit has been used in the preparation of teas for a long time because they are well known for their health-promoting properties. 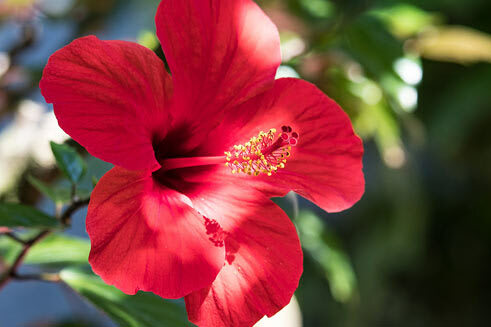 For example, hibiscus contains a high level of antioxidants that help the body defend itself against harmful free radicals. 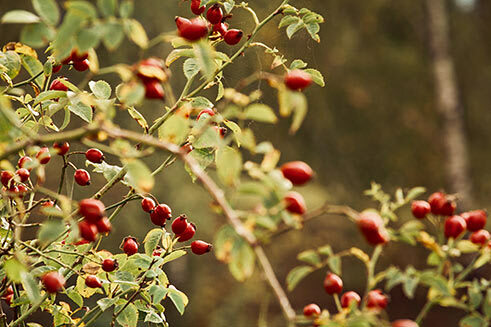 Rose hips simply explode with vitamin C, and they also contain antioxidants as well as other vitamins and valuable minerals. The healing properties of apples are legendary. According to tradition, orange blossom has calming properties. And peaches are bursting with vitamin C that is good for our immune systems. Conclusion: depending on the mix, fruit teas provide adults and children with a dose of goodness and are free from caffeine. They should therefore be seen as a healthy drink with a high vitamin content and can also be enjoyed cold as a refreshing and delicious thirst quencher. Why is there a green tea called "gunpowder"? It is called gunpowder because the leaves are rolled into little balls. They then look like little black pellets of gunpowder, which was also invented in China. 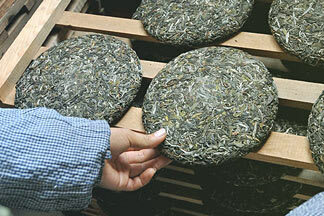 This rolling method is used either for dried green tea or for oolong tea. 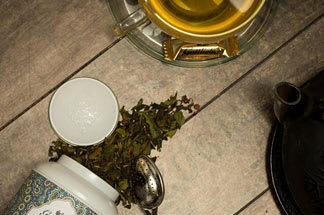 The blends available from Gottlieber are the gunpowder green tea variety. The production of this tea type dates back to the Tang dynasty (618-907). 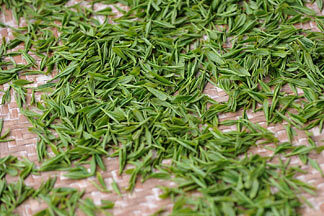 At that time, the leaves of the green tea plant were dehydrated, steamed, rolled by hand and then dried. 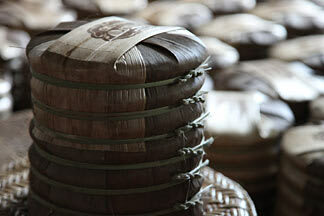 Today, gunpowder is still picked by hand and then roasted in a special procedure that prevents fermentation. It is subsequently rolled by machine and packed after at least three drying processes. By rolling, the leaves become less susceptible to damage and so retain their taste and aroma better. 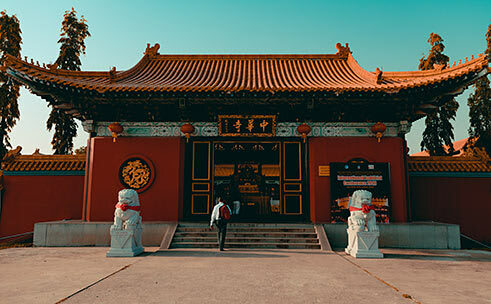 In China, gunpowder is known as pearl tea. 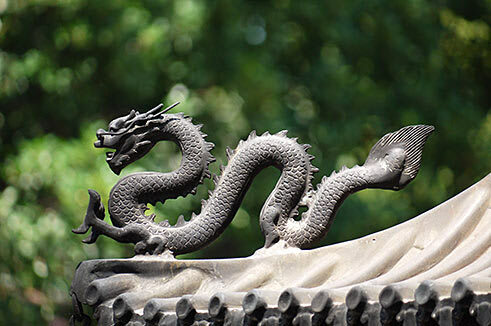 The legendary emperor Shennong ruled in China almost 5,000 years ago. He was a stickler for cleanliness and even had his water boiled before it was brought to him. During a long journey, the emperor had his water boiled under the shade of a large tree to quench his thirst, and the wind blew a few leaves into the water. The water took on a light green tint and the steaming kettle started to give off a pleasing aroma. The emperor tasted the drink and was delighted by it. He felt invigorated and refreshed by this strange concoction. The tree was a tea bush and tea had been discovered. White tea is believed to have originated in China in the 7th century. 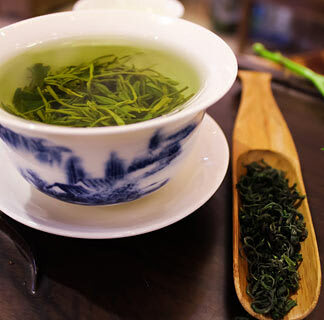 Because it was so rare and tasted so delicious, it was enjoyed exclusively by the emperor and was extremely popular, particularly during the Song dynasty (960-1279 A.D.) At that time, white tea was generally drunk as powdered tea as this was the only way it could be preserved. The emperor even had special officials who sent the tea directly to the emperor as soon as it had been harvested so that he could be served fresh tea too. 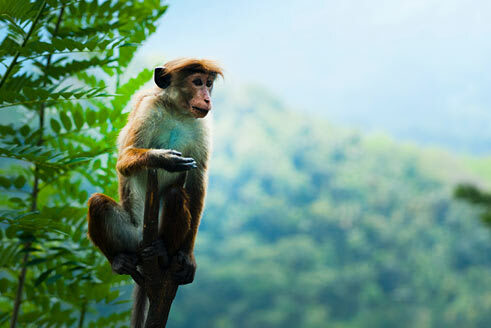 According to legend, monkeys were trained to pluck the very top buds off the high tea bushes. In Europe, white tea only became known in the 19th century. For many centuries, Chinese tea bricks were used as a form of payment. Their production remained a monopoly of the emperor. They were produced in China in various shapes and sizes and then transported by yak and camel to Mongolia, Siberia, Tibet, Turkmenistan and Russia. The finished tea bricks were compact objects that were easy to transport. 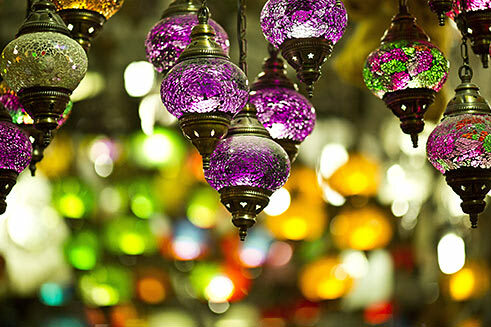 They became a convenient means of bartering between different regions. Not only did they serve as a measure of value, but they could also be used as a foodstuff or medicine. And of course, they could also be used to make a delicious drink. All you needed to do was to break off a piece, roast it a little over a fire in order to disinfect it and give it a bit more flavour and then grate it. Finally, hot water needed to be added and it could be left to steep. In parts of Southern China, Tibet, Myanmar, Mongolia and Southern Siberia, this form of payment continued until the 20th century. It is important to store tea properly. 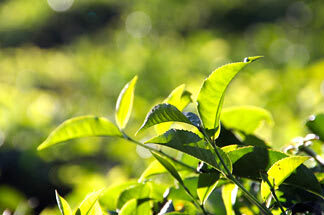 High quality tea soon loses its particular flavour if it comes into contact with sunlight, damp or strong aromas. For this reason, tea should be stored in the dark, in dry and cool conditions in tightly sealed containers. Tightly rolled teabags are also ideal (because they are largely airtight). 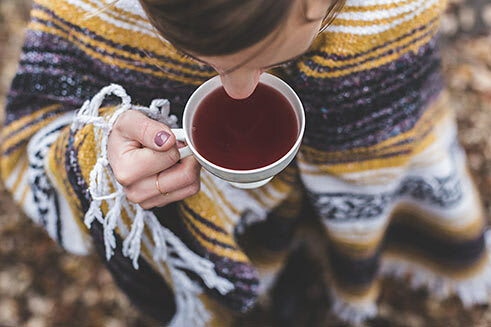 Storing tea away from the air is essential for two reasons: for one thing, the natural aroma of the tea is preserved better and for another, the tea cannot be contaminated by the smell of other products. However: never store tea next to strong coffee or spices such as chilli, pepper or curry powder. 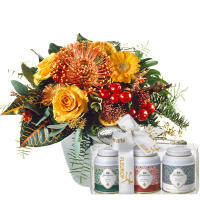 Store aromatic tea blends away from high quality white tea, green tea or oolong. 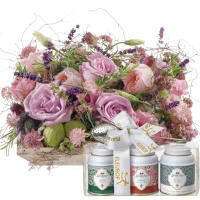 Always store the same blend of tea in your tea caddy and only buy tea in small quantities. Once the pack has been opened, the tea should be consumed within ten weeks. However, if the pack has not been opened, it will remain fresh for up to three years. Dry tea can be stored for an almost unlimited period of time as long as the changes in flavour that come with age are taken into account. The more tea leaves, the more intense the flavour of the tea. The longer the tea is left to brew, the more intense the flavour. The hotter the water, the shorter the brewing time. Different blends of tea require different water temperatures (see the section "The ideal water temperature"). Boiling water will spoil the flavour of delicate teas such as white tea or green tea. 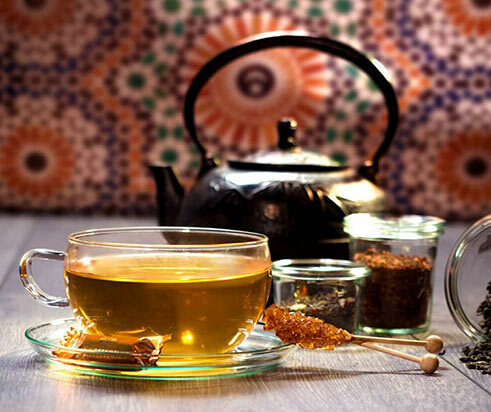 Use a small teapot so that you can better control the strength of the infusion and the flavour. Moreover: the teapot should only be used for the preparation of tea. 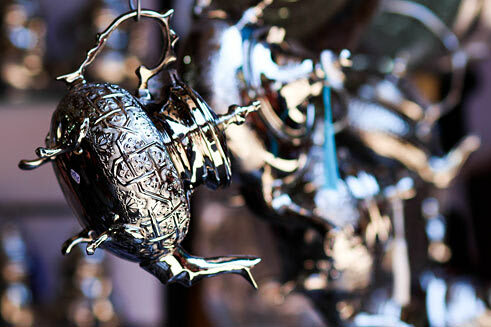 Ideally, different teapots should be used for different types of tea. A delicate tea could be quickly spoiled by the aroma of a stronger tasting tea. The oxygen contained in the water has a decisive impact on the flavour of the tea. Therefore always use fresh tap water and let it run for a few seconds before you use it. Water that has been sitting in the tap or in the kettle loses its essential properties. Only heat the water once. Oxygen is lost every time you re-heat the water. Tasty water is fresh, full of oxygen and is not too hard. White tea and green tea in particular, as well as most of the Darjeeling teas, should be infused with soft water. 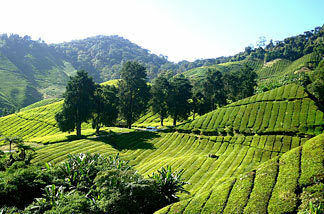 Teas from Assam and Ceylon are less water sensitive. 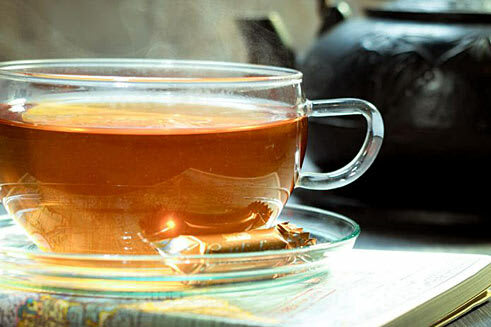 Hard water containing a lot of calcium results in an unpleasant film on the surface of the tea and gives the tea an unpleasant "furry" flavour, preventing the development of the fine tea aromas. Ideally, the water should have 8 degrees of hardness. If your tap water is too hard, you should probably use a standard water filter. Boil the water just once and then let it cool down until the desired temperature is reached. Consult the packaging for the ideal temperature … or experiment yourself. Best of all use a water thermometer. 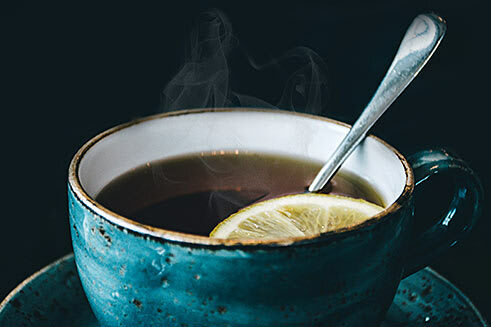 As a rule of thumb, 95°C is ideal for black tea, 70°C to 80°C for green and white teas depending on the blend, and 60°C for Japanese green teas. Do you take your tea as it is, with milk or with lemon? With sugar or with honey? This is not just a question of taste, but also of which country you are in. 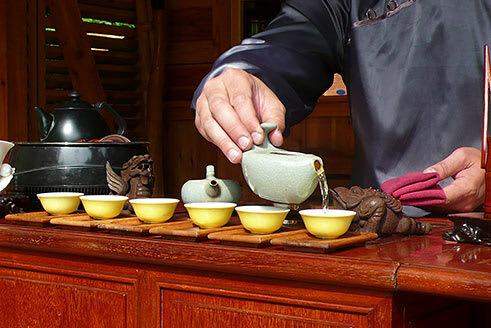 The following additions are usual for black tea, depending on the region: milk in England and India, cream in East Frisia, fat made from yak's milk in Mongolia and salt and yak's butter in Tibet. In Russia and Georgia, it is usual to serve black tea with jam, jellies or fruit preserved in syrup. 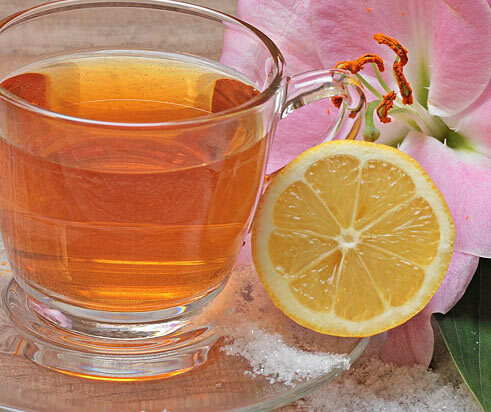 The addition of lemon or lemon peel, which originated from Russia, is also enjoyed by tea drinkers in Western Europe. The most common custom is the addition of sweeteners such as candied sugar, brown raw sugar, honey or white sugar. In contrast, green tea and white tea are generally drunk with no additions. 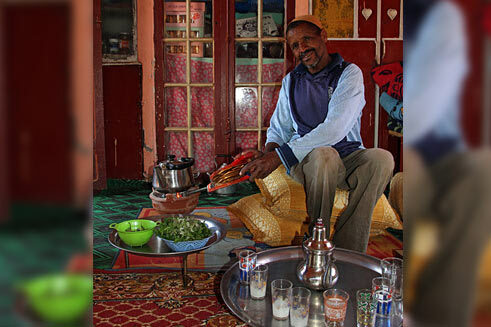 However, there is one exception in the case of green tea: Moroccan green tea, which has gunpowder tea as its basis, is heavily sweetened (see recipe below). Honey or different types of sugar are used as additions almost everywhere. So you can see that tea drinking is anything other than boring! 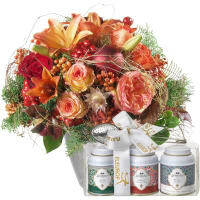 Flowers & honey gift set: visit the shop HERE. 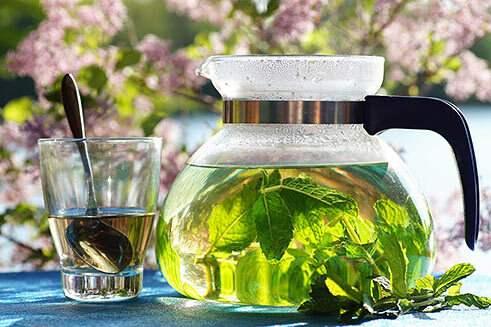 4 sprigs of fresh mint (preferably Moroccan nana mint); 4 tsp Chinese gunpowder green tea; 1.2 l soft water; 10-12 sugar cubes. Wash the mint, reserve 6 leaves. Measure the gunpowder into a teapot (with a strainer insert if possible).
. Boil the water and pour approx. 2 full glasses over the gunpowder and immediately tip away. Place the mint sprigs in the teapot; pour the remaining water, which is no longer boiling, over the gunpowder and mint. The mint has to be fully covered with hot water otherwise it will burn and become bitter. Add the sugar cubes, place the teapot on a small stove (stand with tea light to keep the tea warm).
. Leave the tea to brew for a maximum of 3 minutes. Fill one of the tea glasses with tea, holding the teapot as high as possible so that the stream of tea passes through the air. Pour the tea back into the teapot and repeat two or three times so that the flavour can develop fully. Divide the reserved mint leaves between the glasses, pour the tea over them and enjoy this delicious drink whilst it is still hot. When tea first arrived in England in 1644, the English were dedicated coffee drinkers. Why then did tea become all the rage? There isn't a clear answer to this. What is certain though, is that the British tea culture in the 17th century was very strong and that it was further promoted by Queen Anne. 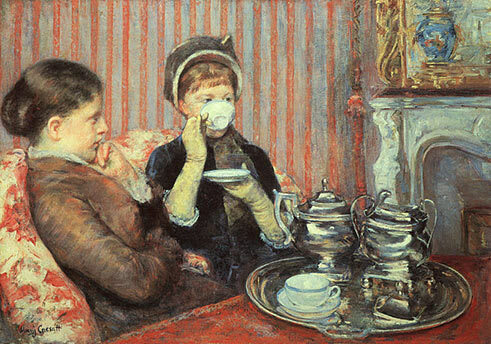 In 1700, tea was served in around 500 English coffee houses. 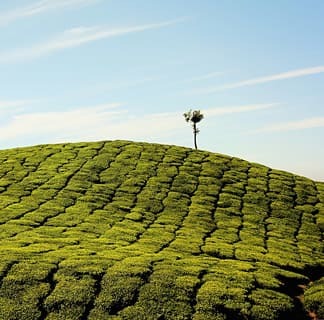 After 1750, the first tea gardens were opened, where tea was taken out of doors and ladies were allowed for the first time. Orchestras played and invited the listeners to dance, and thus tea dances became a fixed ritual around tea drinking. 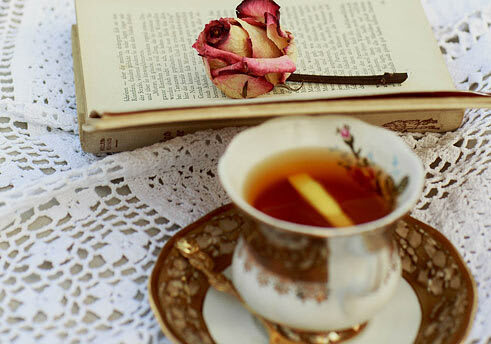 Due to the high taxes, only the aristocracy were able to afford to drink tea and it was seen as a status symbol. It was only in 1783, when the high tax on tea was reduced, that the middle classes (who were still drinking coffee) were able to afford to drink tea, followed later by the working classes. Due to the many tea breaks that were taken during the day, politicians in the 19th century actually branded tea as a "health hazard". However, that evidently had little effect as the English are still deemed to be the world champions when it comes to tea drinking - even today. 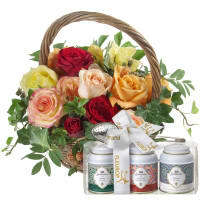 Flowers &amp; tea gift set: visit the shop HERE.